Gone are the days of batch marketing, of impersonal messaging, and of unemotional and untargeted email campaigns. Through AI, today’s brands are experiencing just how much customer relationships, and the emotions that power them, matter to a business’s longevity. Forrester, for example, finds that emotion is the single largest predictor of how a customer connects to a brand, while Gartner finds that consumers who love a brand buy more and are less influenced by the competition. It is within this new marketing ecosystem that Humana Pharmacy, a leading prescription delivery service, harnessed the power of emotionally-driven customer engagement. The following email campaign success story shared by George Kipp at Incite Group Marketing Summit highlights the critical role language plays in driving engagement, and describes how the Humana marketing team used Persado’s AI solution to create the perfect message. 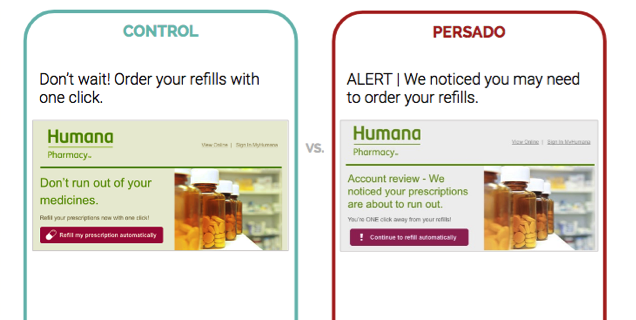 Humana ran an email marketing campaign with the objective of increasing one-click prescription refill engagement. The high rate at which prescriptions go unfilled, even among those with full coverage, is a public health concern with potentially injurious outcomes. In order to both empower members to lead their healthiest lives and improve efficiencies, Humana partnered with Persado to craft the subject line, email body copy, and call to action of their one-click prescription refill campaigns. The Persado platform taps into an extensive database of emotionally tagged and scored marketing language and images, and uses AI capabilities like natural language processing and generation, to create the messages that are most likely to engage readers’ emotions and inspire them to act. Using Persado, Humana saw a dramatic increase in results compared to baseline efforts. The experiment’s value-add did not stop at its Open Rate Lift of 22.8%. Prescription refills had a 73% Click Rate Lift, which moved members one step closer to higher medication adherence rates and better health outcomes overall. For this particular campaign, members were most affected by the use of emotional language, accounting for 61.4% of the variance in their response, whereas formatting (an element that includes the use of symbols, emojis, or text styles) made less of an impression, accounting for 22.9% of the variance. Just as every customer is different, so too are the types of emotions that activate them. Humana used Persado’s AI platform to generate an exponential number of emotionally variant words and phrases especially effective for marketing. In exploring different emotional language, there were clear winners and losers. For Humana’s audience, words and phrases in the email campaign conveying Guilt, Fascination, and Anxiety, for example, performed better than Exclusivity, Gratitude, and Urgency. It is important to note that Persado’s marketing insights for Humana are neither universal nor static. Not only are the findings, product, customer, and time specific to the campaign, these take-aways also reflect real-time machine learning with an ever-expanding knowledge base. Humana and Persado’s partnership optimized an email campaign that made it easier for customers to simultaneously invest more in their own well-being and easily obtain their medication. “In the process of creating this campaign, Persado helped Humana realize that we were letting down our members, and ourselves, by not picking the right language–harnessing the power of words,” said Kipp. With millions of ways to communicate, modern marketing requires a new way of thinking to engage consumers. Kipp shared the following illustration that connects the dots between what his team gained from their campaign with Persado and how it applies to marketers in any industry. The upshot is that marketing leaders have a responsibility to figure out how they can leverage technologies that help their business keep pace, as well as improve, customer lifetime value. This use case illuminates how marketers can evolve to meet today’s customers where they are.